Sometimes we have to readjust our goals for a variety of reasons. We may not have the money, the time, or the desire to accomplish our original goal, as was the case with me this summer. 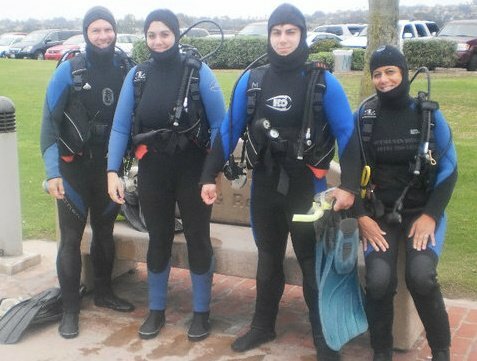 My original goal was to learn how to scuba, and I was determined to make this a reality seven summers ago in San Diego, California. I love being active, the beach and nature and I thought this would be the perfect sport for me. My husband, my two teenaged children and I were assigned to two instructors, a former navy seal (seriously) and a beginning instructor who was still trying to earn his “hours” for his certification. The navy seal took one look at us and said, “I’ll take mom and the son and you take dad and the daughter.” I guess I looked quite capable. Once we layered on our equipment of wet suit, fins, snorkel, mask and (extremely heavy) tank, and received a very brief lesson, we headed onto the rocks and into the water. My underlying anxiety became full blown almost instantaneously and I was falling over, gasping for air and unable to remain underwater.As my daughter and I clutched each other for comfort, I heard the navy seal utter the words that closed the door on this dream of mine. He said, “YOU take the mom and I’LL take the dad.” My husband, my son and the navy seal had a wonderful experience. My daughter and I held onto each other for the remainder of the torturous experience, which seemed like a lifetime. Our instructor wasn’t much help and obviously hadn’t yet dealt with this level of nervousness. When I told him I had to go to the bathroom, he told me to “Just go.” Like a good student, I followed his instructions. His inexperience was pretty clear at this point, since I soon learned that wet suits aren’t porous. I was relieved to be alive after the whole experience, but felt defeated that I wasn’t very successful. In speaking with a friend of mine who frequently snorkels in San Diego, she inspired me to get back in the water. 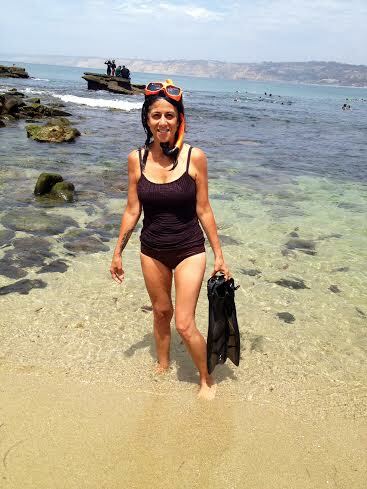 She recommended that I give snorkeling a try since I could, “Still see the pretty fish, without all the hassle.” She also advised me to go to The Cove in La Jolla, San Diego, since they have the best snorkeling conditions. This sounded ideal and I could hardly wait to try it when visiting San Diego this summer! After a quick stop at Children’s Beach in La Jolla, San Diego, to see the seals, we had lunch at a beautiful rooftop restaurant (George’s) with an ocean view. We hadn’t come across The Cove on our brief walk earlier and were anxious to find it after lunch. While eating and looking out at the awesome view, we were quite surprised that The Cove was almost directly under the restaurant, as evidenced by the tiny specks of people moving about in the water in an unusual way….they were snorkeling! Unfortunately, we had to drive to another location to rent equipment, which meant we had to sit in traffic (again) and circle to park (again), since La Jolla is a very popular destination. Since there was an area to snorkel near the rental shop and it was tempting not to have to experience the traffic and parking again, we decided to give this area a try. I didn’t even bother to get into the water, since I could see the conditions were not ideal for snorkeling and, after all, I was (trying) to fulfill a dream, so, back in the car we went. I didn’t even feel the cold water as I entered the shallow water with just a mask, snorkel and fins (no wetsuit). Nor did I feel the sharp edges on the rocks beneath my feet, later realized by a fairly deep cut on the bottom of my foot. I’m sure my adrenaline was at its peak, since the feeling of exhilaration was incredible! The water was clear, the fish WERE pretty and I was relaxed knowing that I could just pick my head up out of the water if I felt overwhelmed. With my husband’s encouragement at the edge of the water (and the fact that there were kids under eight gliding with ease through the water beside me), I snorkeled and LOVED it! After about 20 minutes, I exited the shallow waters and fell into my husband, laughing hysterically. I had to hold onto him to keep from falling over. I wasn’t sure what was happening, but it felt like all kinds of emotions were finally being released. I was exhausted, but satisfied and proud at what I had accomplished, years after my failed attempt to check something off on my bucket list. 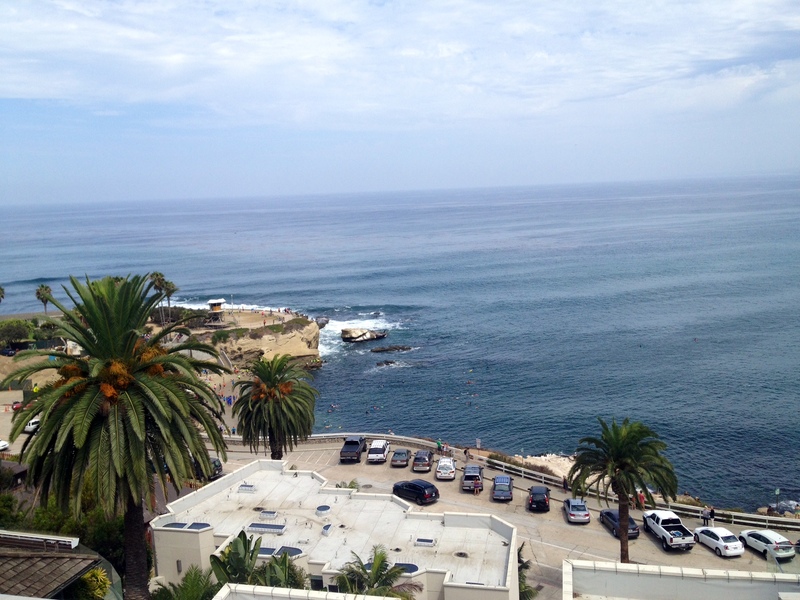 I didn’t scuba dive, but I did snorkel in La Jolla Cove. I’m sure the sense of satisfaction, happiness and pride were no less. After reading the comments I thought about how people were (kindly) commenting on how I looked. This was not my motivation in posing for the picture. If it was, I surely would have smoothed out the gathered bathing suit material around my midsection. The reason I wanted my husband to snap a picture of this specific moment in time was because of how I FELT and I wanted to remember it forever. I DID IT! So if you have been putting off something on your bucket list because of time, money or because you’re not sure you have the courage, don’t abandon your goal altogether, instead, try a simpler, yet related activity. I can’t guarantee you’ll feel like a rock star, but you might be surprised at how fulfilling it may be! Thanks for reading! If you enjoyed this post, please subscribe to Into My Fifties & share. Well done. I’m proud of you!